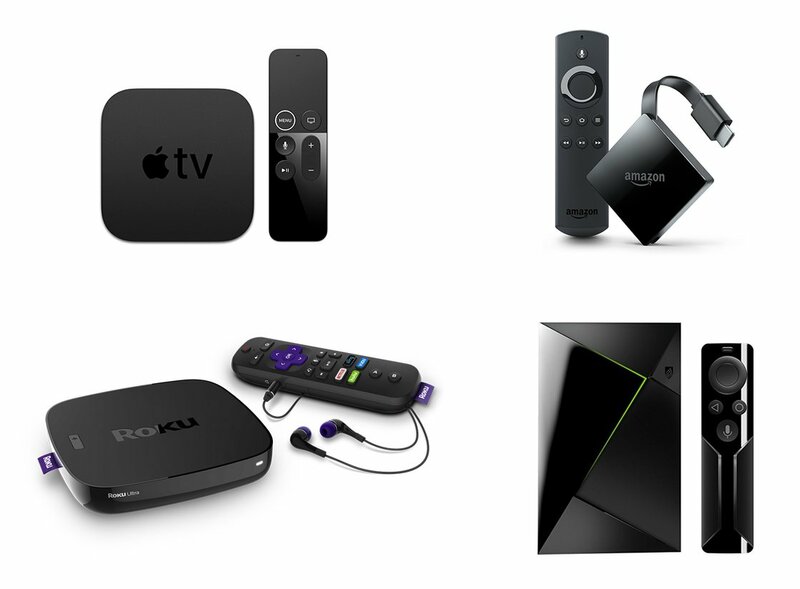 Let’s call these media streaming boxes the Big Four: Apple TV 4K, Fire TV 4K, Nvidia Shield TV, and Roku Ultra. Why not the Fabulous Five, you ask? What about Google Chromecast Ultra? The Chromecast Ultra forces you to use your smartphone as the remote, like some kind of animal. Disqualified! Well, we ain’t going without our Netflix and Amazon Prime Video, so we chose one streamer, warts and all. For busy executive types who like to cut to the chase, the streaming device we chose was…the Apple TV 4K. What puts Apple TV 4K over the top is something that Steve Jobs and I have always agreed on: the user experience. Setup is a dream (especially if you have an iPhone or iPad). As a gateway to your streaming services, your photos, and your music, the user interface (UI) is elegant, smooth, and surefooted. The UI is a joy to look at, offering equally alluring light/dark modes. In a rare nod to interoperability, you can program virtually any IR remote in seconds to control the Apple TV 4K. While Apple TV 4K trails in sonic capability (no Dolby Atmos, Dolby TrueHD, or DTS), it leads the pack in potential image quality. Why “potential?” Because most users will likely never get the best picture out of this thing. The good news is that Apple TV 4K is the only current streaming device that could possibly give you the proper 4K picture in the proper mode of HDR at the proper frame rate. However, out-of-the-box, it delivers everything in 4K (cool, because it has a great scaler); a frame rate of 60Hz (not cool for movie-loving users, as theatrical movies are delivered in 24Hz); and in HDR (horrible, because 99% of video is not HDR, which means 99% of your video will be wrong, and menus will blast your retinas). Defeating this default is hilariously unintuitive. First, you drill into the settings and set your TV up as SDR — Standard Dynamic Range (even if it’s HDR-capable…what?). Then, elsewhere in the settings, set the box to auto-switch to the native frame rate (60Hz, 30Hz, 24Hz, etc.) and native HDR. The big dealbreaker for Apple TV 4K is that it’s missing the largest repository of 4K video on the planet — YouTube. As Apple TV is tied with Nvidia Shield TV as the most expensive streaming device, the least they could do is include support for YouTube’s VP9 codec. Ads on the home screen — fail! Bristling with storage options — USB, microSD, NAS, etc. Ads on the Home Page — fail! The Roku is the most complete streaming device and has the best chance of the Big Four to satisfy plug-and-play users. But scratch a Roku, and you quickly reveal the stale and musty. It lacks fun. We recommend Apple TV 4K. You need to dig into the settings for the best picture, but it’s worth it. The Apple TV 4K has the gentlest dealbreakers for day-to-day enjoyment and delivers the prettiest, snappiest, and most satisfying streaming experience.